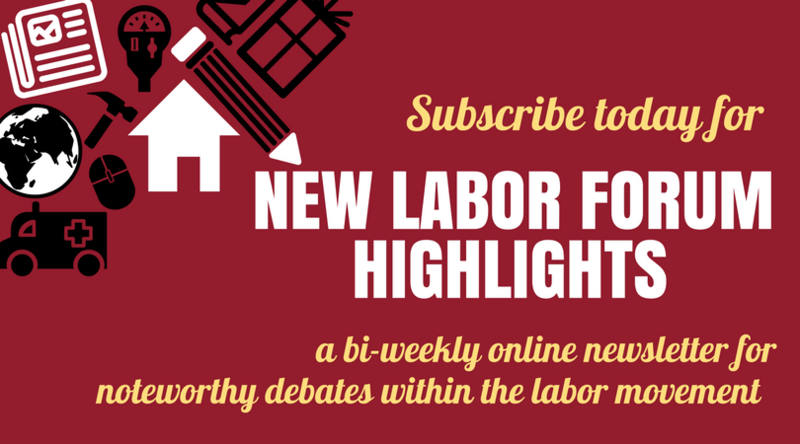 Some of the best of what New Labor Forum has to offer comes in the form of the artwork we publish and review. In addition to printing poetry in each issue, NLF Books & the Arts Editor Gabriel Winant ensures that we carry appraisals of fine arts exhibits, film, theater, and literature, as well as books you might expect. And our “Out of the Mainstream” listing curated by Matt Witt provides brief synopses of films and books less widely reviewed, but of likely interest to our readers. In this installment of the newsletter, we offer a review by Adom Getachew (due out in our May issue) on a current exhibit “The Sweat of Their Face: Portraying American Workers.” This show is on view through Sept. 3, 2018 at The National Portrait Gallery in Washington, D.C., a venue much better known for Presidential portraiture than for the enslaved childcare worker, bobbin girl, powerhouse mechanic, sandwich maker, and other laborers included in this show. And we include from the current issue of the journal the poem “Winter after the Strike” by the Pulitzer Prize-winning poet, Gregory Pardlo, who writes with poignant grace of his childhood as the son of a local union leader in the tragic PATCO strike of 1981. Also on the subject of the PATCO strike, Pardlo’s new book, Air Traffic: A Memoir of Ambition and Manhood in America, is due out in April 2018. On the theme of new and forthcoming books, NLF Editor-at-Large Steve Fraser’s Class Matters: The Strange Career of an American Delusion is due out next month. In his latest book, Fraser examines six signposts of American history—the settlements at Plymouth and Jamestown; the ratification of the Constitution; the Statue of Liberty; the cowboy; the “kitchen debate” between Richard Nixon and Nikita Khrushchev; and Martin Luther King’s “I Have a Dream” speech—to explore just how pervasively class has shaped our national conversation, despite our best efforts to pretend it doesn’t. And finally, in the run-up to the Academy Awards, we direct your attention to a recent New York Times review of three Oscar-nominated documentary shorts featuring working-class protagonists and themes: Elaine McMillion Sheldon’s Heroin(e), Kate Davis’ Traffic Stop, and Laura Checkoway’s Edith+Eddie. In some years, watching the Oscar-nominated documentary shorts is the easiest way to spot the winner. This year there are plausible rationalizations for all five. The front-runner is probably Elaine McMillion Sheldon’s “Heroin(e),” which bears the imprimatur of Netflix, the company that took this statuette last year with “The White Helmets.” The most visceral of the nominees, it addresses an issue in the news–the opioid epidemic– with ….